Today will mark the 74th anniversary of her death in Ravensbruck Concentration Camp. In case you needed a short reminder, Mother Maria was rounded up by the Nazis in Paris after they uncovered a letter addressed implicating her son, Yuri, and Father Dimittir Kelpinin in a scheme forging false baptismal certificates for the Jews in the poor neighborhood around Rue Roumel. By the start of the WW2, Mother Maria was managing a home for the destitute, the mentally and physically handicapped, a sanctuary for the many refugee Russian emigres who had fled the revolution. Had they have gotten word about how she had orchestrated a rescue plan along with the sanitation workers that involved hiding Jewish children in garbage cans and then transferring them to her house in darkness where they eventually would get transported via bakery trucks and other commercial vehicles to the South of France, they would have rounded her up sooner. (An illustrated children’s book tells this story Silent as a Stone). Their involvement in the Resistance eventually did them in. While her son Yuri and Fr. Dimitri Kelpinin perished in Buchenwald camp within two years of arriving there, Mother Maria who had been used to hard labor and difficult living conditions, managed to survive for several more. Eventually her health started failing her as she was used to giving away the meager portions of bread to her other prisoners. Her other workmates remembered how she was always joyful. As an idealist with deep sensitivity, she had a way of seeing the beauty even in monstrosity. On the 30th of March, it so happened that Good Friday fell on that day in the year 1945, Maria Skobotska even though she was not chosen, asked to stand in the place of another woman prisoner. The following day, Holy Saturday, she was led into the gas chambers and surrendered her soul. The liberation would occur only several months later. How is this sort of love possible? What does the story of this woman, twice divorced, a revolutionary, once an agnostic, a poor refugee, a smoker and beer drinker in her nun’s habit—what does this story have to do with us? Perhaps the bigger question is how is love, the kind of love typified by Mother Maria, the love for the Other dictated in the Gospel compatible in the 21st century, a century that glorifies self-promotion, self-indulgence, cut throat competition, and commodification? How is that sort of selfless love even possible for human beings in the modern era? That is the question that started the quest for Anberin Pasha. She and Emanuel Sebau are the producers behind the recent documentary film Love To the End. Anberin who studied film making in the US is of Indian descent became a convert to Orthodoxy. She fell in love with Orthodox theology because of its insistence on love. She moved back to the US from Serbia where she had been living with her husband to study theology at Holy Cross Seminary in Brookline, Massachusettes. She wanted to find the answer to this burning question: How can human beings, whose love is so limited, love so completely? The answer was not an intellectual exercise; it is embodied in the figure of Mother Maria. It was at this moment that she started her journey to Christ. She turned that love of self to the love for the Other. After the death of her daughter, she wanted to become a mother to the world. There is a theological term for this, Anberin points out, proaires, which means a turning or leaning with all your intentions, your mind, your body, your entire soul to God. It is from repentance that divine love can radiate. The film also features the testimony of noted scholar/ historian Jim Forest; he was instrumental in publishing the story of Mother Maria after her canonization in 2004. What instigated your interest in creating this documentary? When a sister nun told me the story about Mother Maria’s life, the one thought that stayed with me was that there was no limit to her love. I asked myself is that humanly possible to love the ‘other’ so completely? What was this love? I had to know how a human being could come so close to God’s divine love. 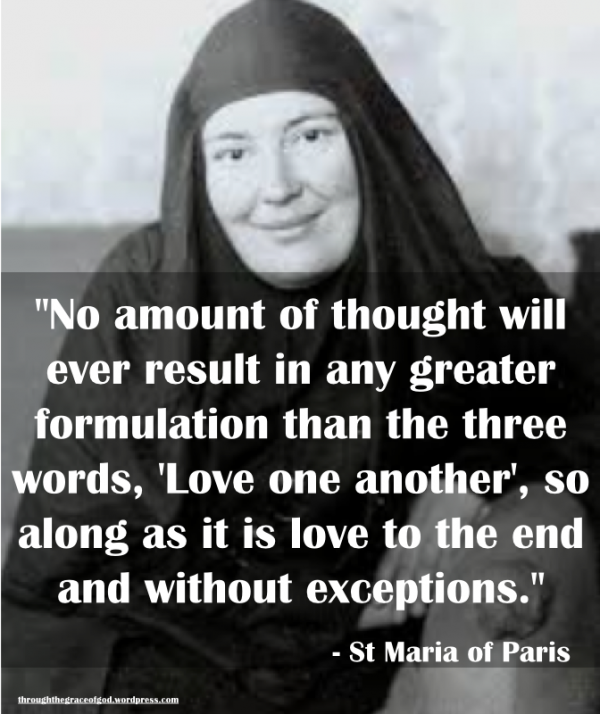 So I traveled all the way from Serbia to Holy Cross School of Theology in Brookline MA to learn how we can be as Mother Maria was, an embodiment of love. Why do you think Mother Maria is a saint particularly suited to speak to us in the 21st century? Our lives are not simple and clean, neither was Mother Maria’s she was twice divorced, at the age of 14 she lost faith in God when her father died. She was convinced then that there was no just God. However, she was a deeply sensitive person who wrote poetry and studied theology at the Seminary in St. Petersburg. She quickly saw the failure of the Bolshevik Revolution that led to her return to faith. And from then on, every tragedy in her life becomes a heavenly fire through which she passed transforming her into this woman burning love for her neighbor; the homeless, the destitute, the Jews fleeing persecution. Many people who have endured broken relationships, the loss of loved ones, loneliness see in her, the hope to transcend themselves. Can you give a synopsis of the documentary? Love to the End really attempts to show how the life of Saint Maria manifests and transforms the lives of three American women who develop a relationship with her as they struggle with different challenges. What would you like to accomplish with this film? The hope that we may be inspired to rediscover her life and to believe that we are all capable of transcending ourselves and to rediscovering that divine love that can move mountains. We are working on a film on St. Mary of Egypt and reading her life as model to face our addictions and how to go beyond them. The model that Mother Maria presents for us is this—that through love and especially the love for the Cross and for Christ—we can transcend the suffering of our lives. We are very broken; our lives will be fraught with disappointment and suffering. If it had not been for her enduring capacity for love, I am sure this woman could have wound up a miserable, drug-addicted street woman. Think about her life: she was born into a well-to-do family, but wound up a refugee in the slums of Paris. She fell in love and wound up broken hearted when her relationships with the men who were supposed to love her fell apart. sleeping in a cot under the stairs. She was educated and an accomplished manager, she was the mayor of her town at one point, yet wound up slaving away into the night for 12 hours making silk scarves and dolls to provide for her family. She felt the joy of motherhood only to know the knife of grief when she lost her daughter. She became disillusioned at the movement that had given her life purpose. She could have lost faith in everything and fallen into despair. Instead, she emptied herself (the idea of kenosis that the saints talk about) and dedicated her energies, her life to helping the poor, the mentally ill, the strangers, the persecuted. Perhaps that is the answer that Mother Maria gives with her life: that you can transcend loss, pain, disappointment, disillusionment and grief when you love till the end. Like Christ, it is love that transcends the world. How do you acquire that love? It must be through Christ. For only through Love itself can you love. Only Christ’s love can save the world; it is mind-boggling and illogical, but it is the only vehicle for salvation. Watching this film during Great Lent helps us remember this key idea–to choose to love till the end and the Grace of God will infuse us with the power to overcome the brutality of this broken world.